Did you know Twilio comes with a collection of mix n match components (called Twimlets) that lets anyone build in a few minutes a simple “phone receptionist/menu” for inbound calls (you can build a lot of other things too!) that’ll cost $1/month plus a penny per minute for calls? It took John and I about 15 minutes to get a new phone number and receptionist up and running thanks to the magic of Twimlets, and we did not need any website hosting (Twilio came with everything we needed). 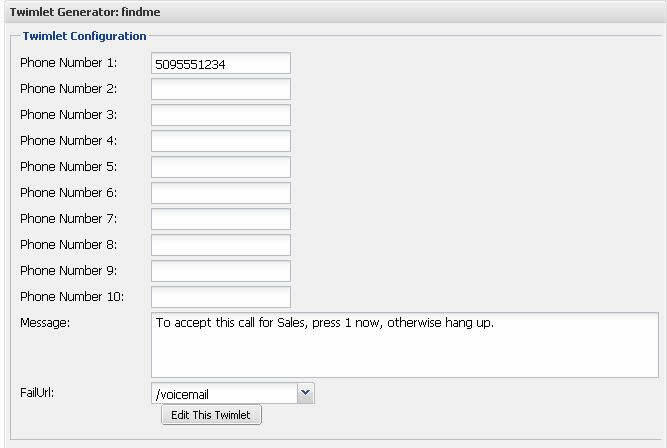 Here’s a quick step-by-step to implement a main receptionist menu that tells the caller to “press 1 for Sales, 2 for Support, or 0 to leave a message.” It requires NO web hosting account, just a Twilio account and a Browser! Grab a phone number. Twilio makes that easy, although you have to use their web API if you want to “browse” available numbers. Update: you can now browse phone numbers, even looking for patterns like “1234”. At the bottom of the screen click on Twilio Labs. Then Click **Twimlets **in the menubar. Then click **Access Your Twimlets **on the right side of the screen. we’ll do the “lower level” menu options first, then do the main receptionist menu. 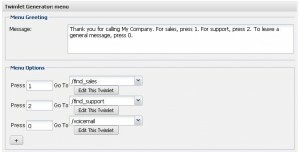 Create a voicemail box. The Voicemail twimlet lets you provide a prompt (text-to-speech, or an audio file), get a voicemail from the user, then email it to you. Automatically. For prompts we’ll use text to speech for now, but then we can use our voicemail box to record real prompts later! 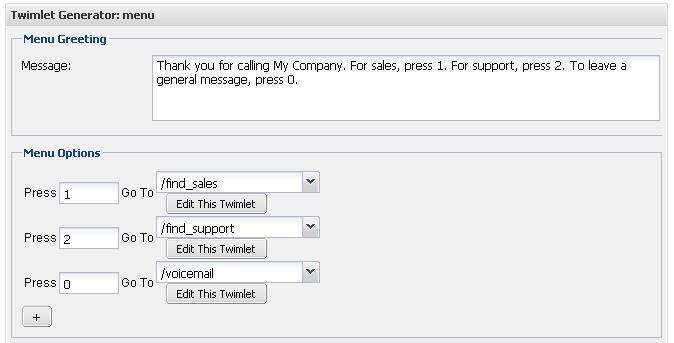 Select Voicemail from the drop down menu, then click Create New Twimlet. Click save. All of your Twimlets will have the same prefix URL, and you provide the shortcut name for your Twimlet. Call this one “voicemail” and click OK.
Click the **My Twimlets **bread crumb to return to the main menu. 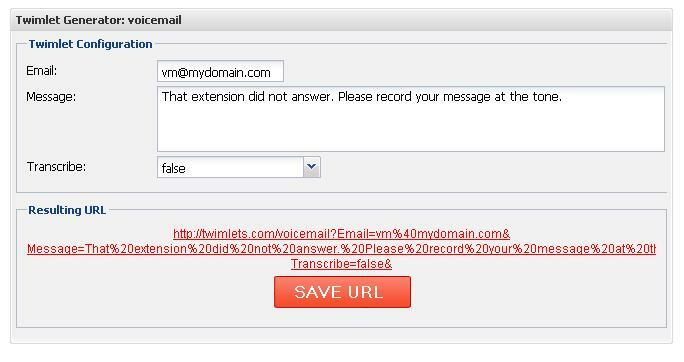 For “failover” select your voicemail box from the dropdown list of your Twimlets (that’s why we created it first). Save your Twimlet, calling it “find_sales”. 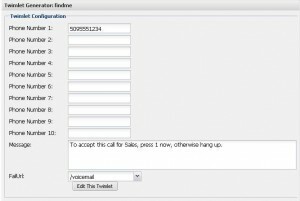 Repeat the previous step creating a “find_support” Twimlet, using whatever phone number you want to route support calls to. Now create the main “receptionist” menu. Back on the main menu, select “Simple Menu” and click **Create New Twimlet. Fill in your main greeting, and create options 1, 2, 0 as shown, with each option pointing ot a different Twimlet. Point your Twilio Phone number to your “main_menu” twimlet. b. Paste it into the “voice” settings for your Twilio number. Go to your main account page, click Numbers. Click the phone number. 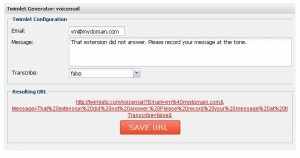 Paste the URL into the Voice text box (and make sure the checkbox is checked) then save. That’s it. Call your number and you’ll hear your menu. Want to replace your main menu prompt with your friendly voice instead of text-to-speech? Simply call your number, press 0, and record your prompt as a voicemail. In a few seconds, Twilio will email the audio’s URL to you (already hosted at Twilio for you!). Go back to your Twimlets menu, click the main_menu Twimlet to edit it. Replace your text message “Thanks for calling…” with the audio URL (probably best to add a .wav extension). Re-save the Twimlet. Now do the same thing to record a real voice prompt for the “voicemail” Twimlet.